Get your team out for a fantastically fun and unique experience. You will feel the vibe the moment you walk through the door! Let us take your coat, perhaps pour you a glass of wine, even offer a few hors d'oeuvres. Let the surrounding music begin to spark up your creative as you chill in our lounge and prepare to have fun! At Unarthodox, we combine all of the arts to create an environment you can feel relaxed participating in. Our immersive, creative space in the heart of Chelsea, NYC will get everyone out of the isolated, mechanical state of mind and inspire your group to develop great new ideas together. Check out our all inclusive “Soup to Nuts” package, which includes full catering and beverage amongst other great perks. If all-inclusive is not for you, we also offer a plethora catering options that vary from cheese plates to full buffet dinner. All team outing experiences can be fully customizable to fit your team. You can also take advantage of our Loyalty Program, “La Familia”. 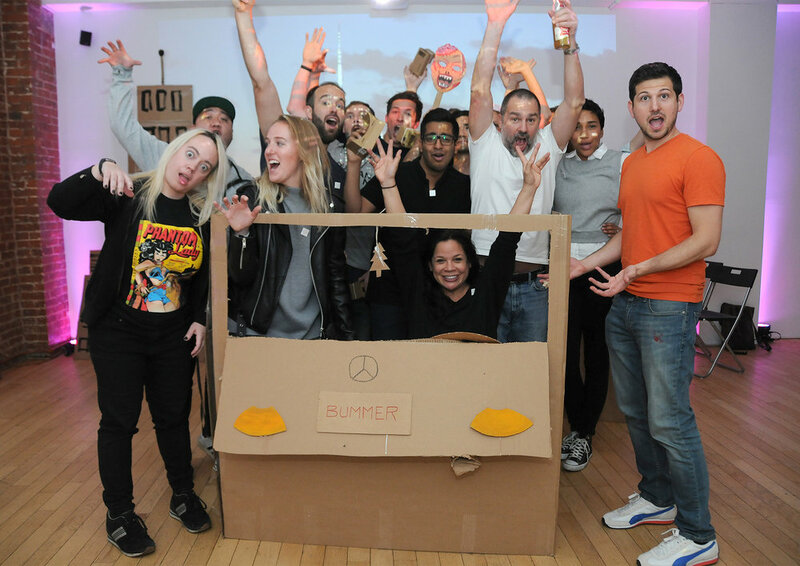 Choose from many of our Fun Team Building Activities in NYC! Touch is the first sense to develop when we are born. Yet most of our life is experienced through sight and sound. In this experience, we take you back to the very beginning. Explore your sense of touch by sculpturing...without sight. You will receive an introduction to basic clay handling. Then you will sculpt...blindfolded! You will be immersed in music and aromas. Sculpture Without Sight is not about the finished sculpture, but the process of feeling your way through a mental image. No sculpture experience necessary. Just your willingness to express yourself through touch. At the end, your team will walk away with an amazing experience. Sculpture Without sight is $780 for a private experience of up to 12 guests. Additional guests are billed $65 per person. Maximum amount of guests allowed is 38. Total time of experience is 1.5 hours. If you choose any of our catering and beverages packages, the total time will be extended an additional half an hour. Sculptures are a tool in the process of exploring your sense of touch and are not intended to be taken home. 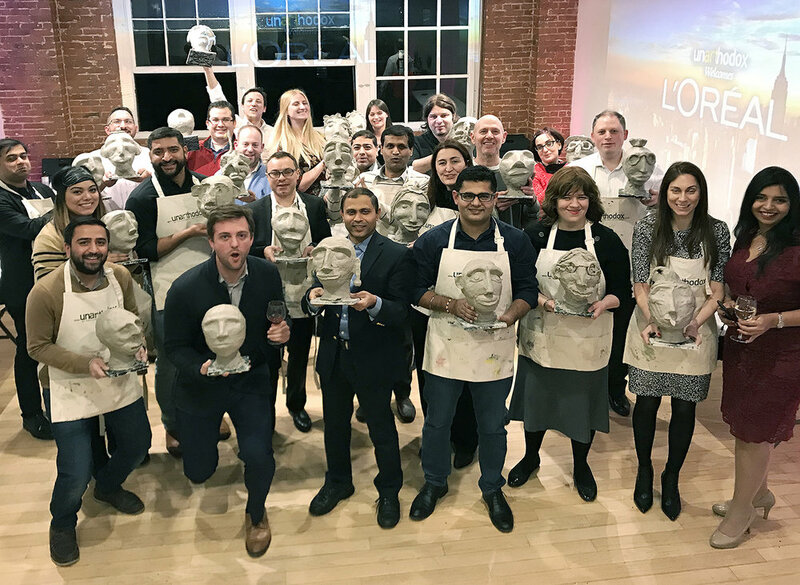 A great creative night out! This is not your typical art and wine class, we incorporate paint, music, aromas and a meditative environment to help unleash your creativity! Our instructor will guide you through the process of creating a masterpiece! You can choose any painting from our selection or we can design a special painting for your team. You can also create a team collage! Each team will work on their own fragment that will eventually become a part of one group painting which can represent your company's mission. You will be amazed by the results! You do not need to be an artist. All supplies and materials are included. Just bring the wine and we’ll do the rest! Paint & Sip is $660 for a private experience of up to 12 guests. Additional guests are billed $55 per person. Maximum amount of guests allowed is 34. Total time of experience is 2 hours. If you choose any of our catering and beverages packages, the total time will be extended an additional half an hour. Let’s paint a team mural! Perhaps do a customizable painting with your company logo. How about a musical chairs team painting experience. Or should we say… artical chairs. Your team will be able to work together to produce one, or multiple works of art. This is a fully customizable painting experience! This is a very immersive experience. In this session, you will be given a canvas divided down the middle. For each side, you will create an expressive art piece using acrylic paint. Your environment will be manipulated by a 270-degree projection of various visuals and specifically selected music. Each of the two environments will be 20 minutes long and are designed to evoke different moods and emotions. It is an expressive session where it encourages you to go with your intuition and create from within. This session helps you make the connection between intuitive thinking and the creative process. You do not need to be an artist or be familiar with the process of creating art. The intention is to tap into your creativity and allow you to freely express yourself. It is therapeutic and most importantly - lots of fun! Intuitive Art is $660 for a private experience of up to 12 guests. Additional guests are billed $55 per person. Maximum amount of guests allowed is 15. Total time of experience is 1.5 hours. If you choose any of our catering and beverages packages, the total time will be extended an additional half an hour. Imagine Pictionary, Charades, and Game of Clue all combined into one artistic adventure. Participants have to illustrate a secret word by the use of paint, markers, clay, charcoal, pencils, random objects, body movement, and theatrical improvisation in order to have their team guess the word. The more words your team guesses, the more clues they will get to solve the final puzzle. At the end, anyone can win, but what matters is the team bonding skills that are developed through this fun, memorable experience. Picture This is $660 for a private experience of up to 12 guests. Additional guests are billed $55 per person. Maximum amount of guests allowed is 30. Total time of experience is 1.5 hours. If you choose any of our catering and beverages packages, the total time will be extended an additional half an hour. Team Bonding through improvisation is both fun and effective. Our instructors will design interactive improv games specifically for your team that will start with fun, ice-breaker games, and transition into storytelling and collaboration exercises. 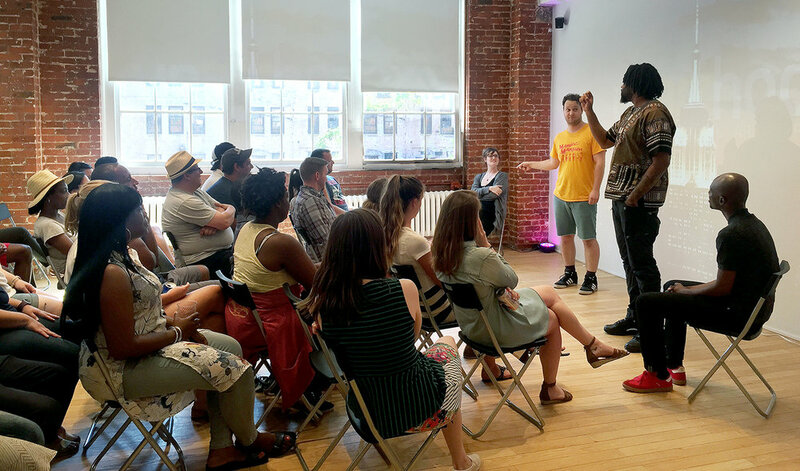 Whether you're integrating new employees, hosting a summit with people from different departments, or just looking for a fun, collaborative day with the team, then the Improv Team Bonding Series at Unarthodox will be a sure hit! Improv Land is $600 for a private experience of up to 12 guests. Additional guests are billed $50 per person. Maximum amount of guests allowed is 50. Total time of experience is 1.25 hours. If you choose any of our catering and beverages packages, the total time will be extended an additional half an hour. At some point in our lives, we’ve all wanted to play a special character, whether it’s a superhero or even a knight defending the kingdom from a fire-breathing dragon! Well, roll up your sleeves because we’re making a movie! In this experience, you will become a character you’ve always wanted to be, creating your costume and props with basic building materials like paint and cardboard. Then it gets really interesting... we make a short film. And not just any film—a Virtual Reality film. Using a special spherical virtual reality camera, you will become the star of your own 360-degree tour-de-force! The best part is: at the end of the experience, we’ll upload your masterpiece online to share with friends and family instantly. Create anything that you can imagine as you learn the basics of Virtual Reality filmmaking along the way. All you need to bring is your imagination—we’ll provide everything else! Virtual Reality Storytelling is $1,020 for a private experience of up to 12 guests. Additional guests are billed $85 per person. Maximum amount of guests allowed is 16. Total time of experience is 3 hours. If you choose any of our catering and beverages packages, the total time will be extended an additional half an hour. let us plan your CREATIVE CORPORATE TEAM BUILDING experience today! Call us at 646.964.4733 or fill out the form below to plan your next unique company outing! WANT to rent our space and throw your own party or schedule an off-site meeting?